Radiant Home Studio is turning 2 so it’s time for a celebration tour! 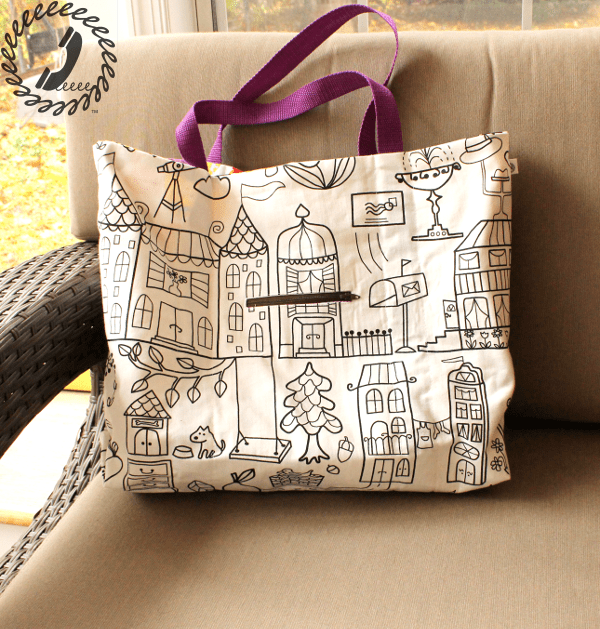 I sewed a couple of the Coastal Totes and am really pleased with the result. We have a birthday party to attend this weekend and I think this tote filled with art supplies will be a great gift for the birthday girl. I used some of the TIDNY fabric from Ikea that I had in my stash. I’ve used that fabric for so many projects! I love the canvas weight and the black and white images are fun to color. Also shhhhh….. I may be giving Bean something similar for Christmas, hehe. 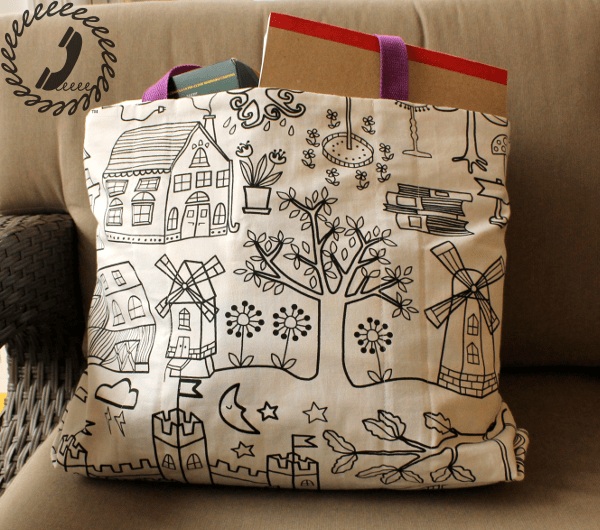 I was most impressed when I saw the pattern as this is no ordinary tote. 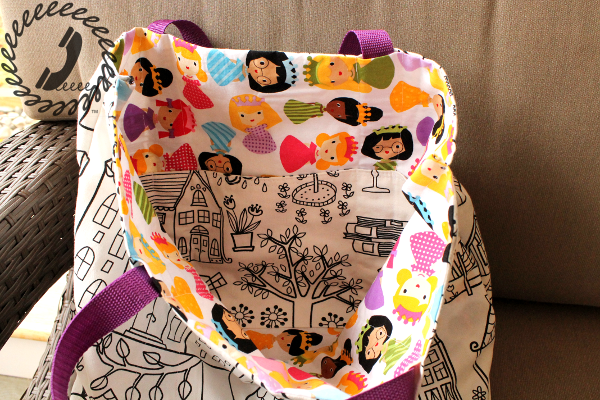 The bag comes together quickly, though it’s sturdy and has lots of details. 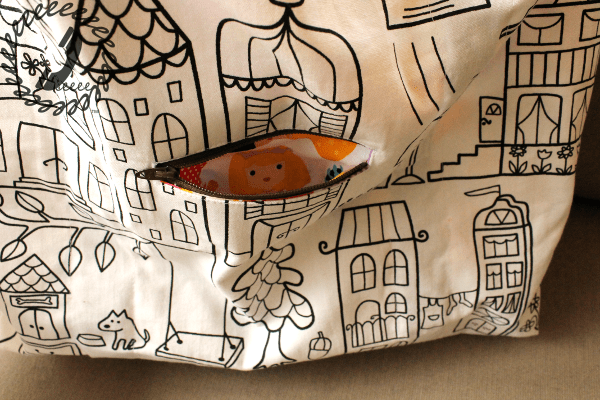 There’s a big inside pocket, zippered exterior pocket, and the option to sew another inseam zippered pocket inside. I chose to do the exterior pocket since I’m used to sewing welt pockets at this point and love a good zippered welt pocket. I couldn’t resist. The pattern uses rope for the straps to go along with the coastal theme. There are great instructions about how to fuse the rope ends together to make the strap loop, but as this bag was intended for a kid I opted for some bright purple webbing I had in my stash. It worked out great with no changes to the actual pattern. In fact, the only change I made was to cut the main exterior piece in two pieces rather than one large piece and that was only because my exterior fabric is directional and I didn’t want the image upside down on the back. It was a super easy change with a big impact. 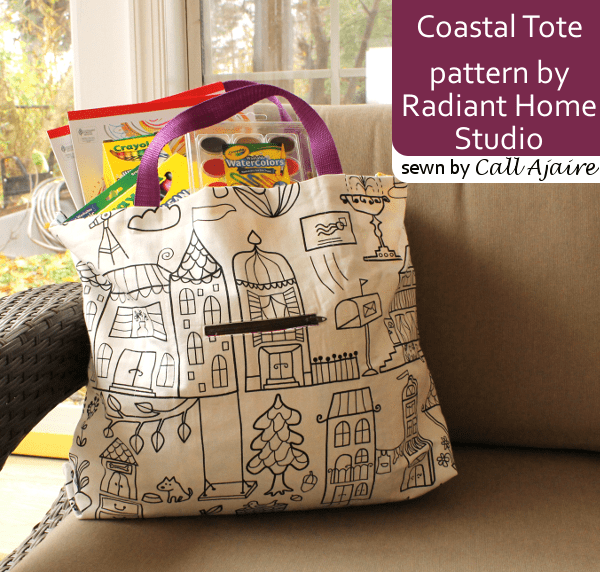 You should know that all patterns at Radiant Home Studio are 20% off with the code birthdaycelebration through December 11th. And check out the rest of the tour below!